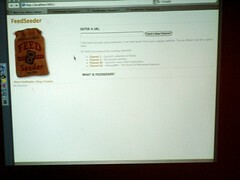 The FeedSeeder demo went pretty well tonight at MinneDemo. I’m pleased. Thanks to everyone there for letting me share it with you. Thanks to Luke & Dan pulling us together. If you weren’t able to catch it, I’ve added the most recent Quicktime screencast to Feedseeder.com (~60mb, ~7min). If you’ve already seen it or want to see more, or talk about some of the concepts behind it, you know how to reach me.